Make data-informed decisions and hire the best-fit talent! Too many companies are making important hiring decisions based on impressions rather than actionable data. In today’s talent landscape, employers need more information about a candidate that goes beyond the resume and the interview. PXT Select™ takes the selection to the next level by helping companies make data-informed decisions so they can hire the best-fit candidates. Powered by the latest innovation in assessment technology, PXT Select is a single, online candidate assessment that produces multiple reports used for selection, onboarding, coaching, and team development. Its versatility and actionable data make PXT Select an indispensable tool for organizations of any size. Improve talent selection by placing the right people in the right jobs. 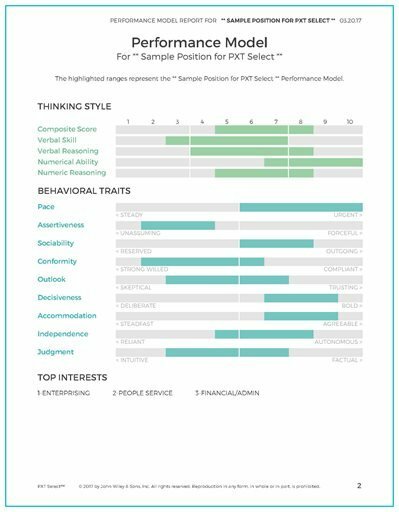 Build a library of Performance Models that can compare internal and external candidates. PXT Select complies with every aspect of the US Dept. of Labor and EEOC guidelines for maintaining fairness in the selection process. 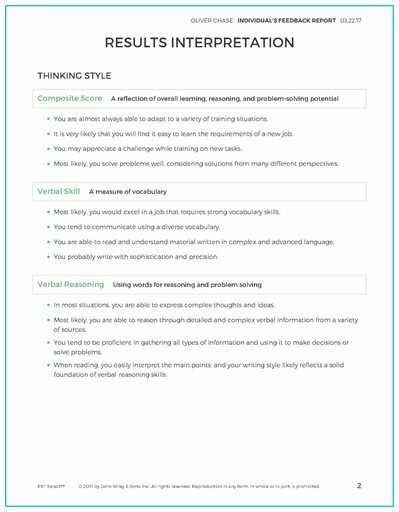 Getting a clear picture of the candidate’s thinking style, behaviors, and interests, giving you a meaningful edge in making the right hiring decision. 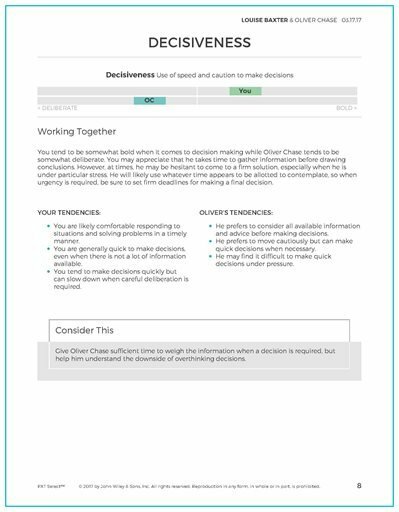 Comparing and matching candidates with positions to make the best-informed selection decision. Conducting targeted Interviews with tailored questions provided based on a candidate’s assessment results. Adding data to traditional hiring methods can sound overwhelming, but it doesn’t have to be. We’ll guide you through each step along the way. 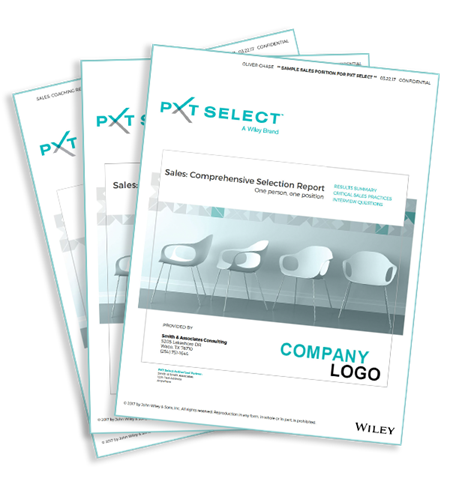 The PXT Select Comprehensive Selection Report contains the primary information used for candidate selection. 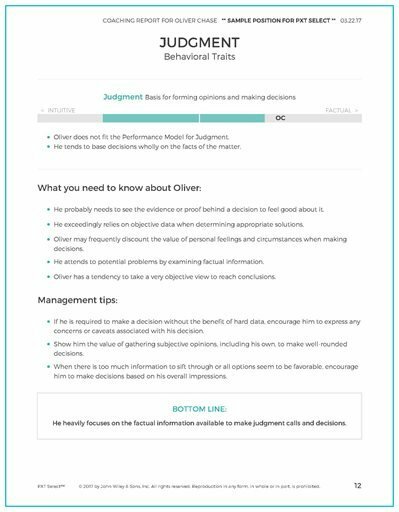 The 11-page report provides clear visuals and explanations of data, making it easy to understand and equipping you with data to determine if a candidate is a good fit for the job. 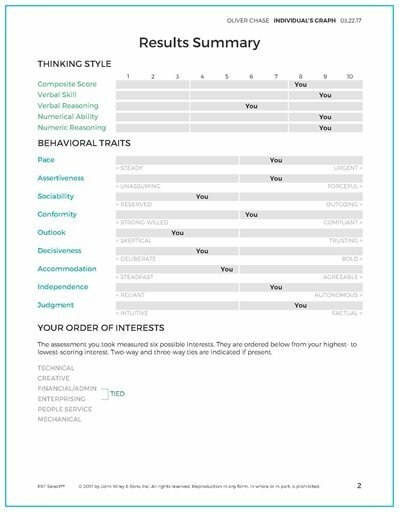 Behavioral Traits: A measure of 9 behavioral traits that measure the candidate’s natural tendencies and compares them to the requirements of the position. 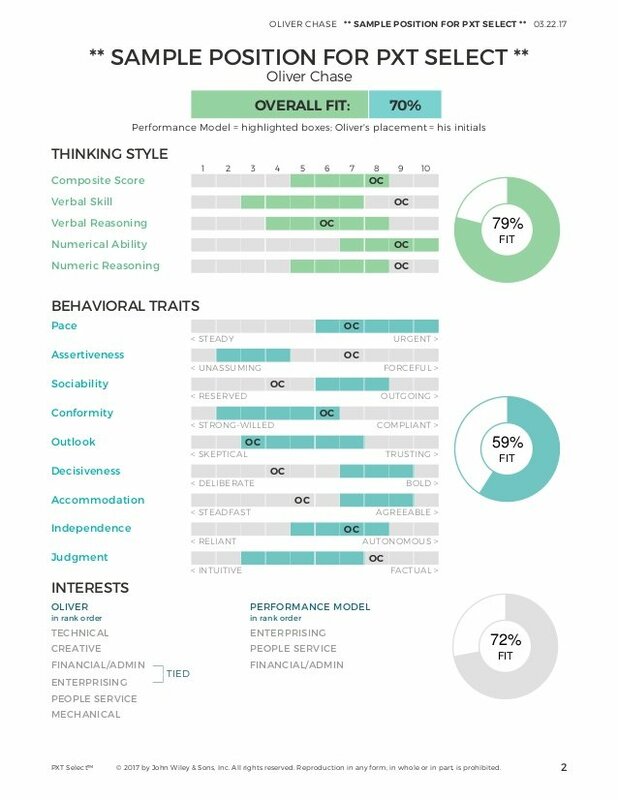 Interests: Insight into the candidate’s motivation around performing different tasks, and how much enjoyment he or she may find in a particular role. In addition, PXT Select provides Interview Questions that are tailored to the candidate based on the individual’s assessment results and the Performance Model for the position, to make the interviewing process more effective. and see firsthand the actionable data you can get about candidates with PXT Select. PXT Select™ has expanded its offering to include a suite of sales-focused selection and development reports tailored to help organizations hire and retain top sales talent. Combined with the entire PXT Select suite, the Sales Reports provide powerful insights to identify and develop sales talent, creating a rich experience for both salespeople and their employers. 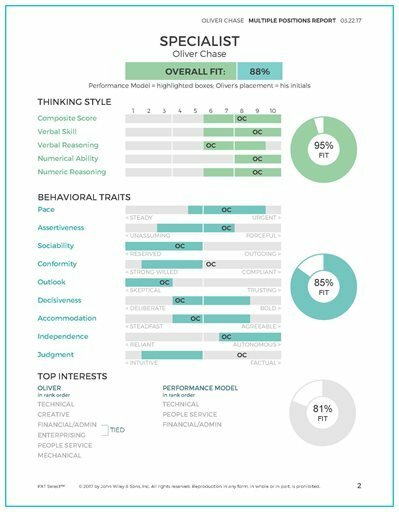 This powerful report helps identify a candidate's fit to a role. It features dynamic interview questions to help strengthen the overall hiring process. 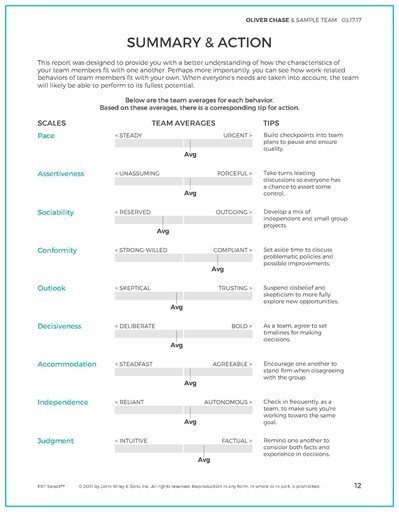 With a focus on sales language, this report highlights critical sales practices and describes how a candidate might demonstrate them, helping you select the right salespeople for your organization. Candidates can learn from PXT Select, too! 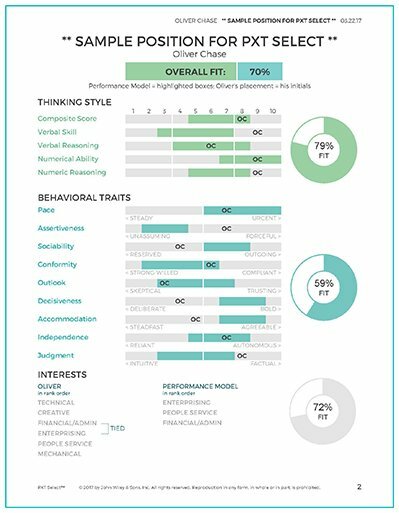 This participant report offers personalized feedback to the candidate or employee using common sales language and does not include critical sales practices. Wish you had coaching advice tailored to each employee? This report gives you exactly that and more! Coaching and developing across an organization can be challenging. Candidates can learn from PXT Select™, too! This narrative report doesn’t reveal scores and is perfectly safe to share with applicants. Sharing feedback with a candidate can be a great addition to the selection process. 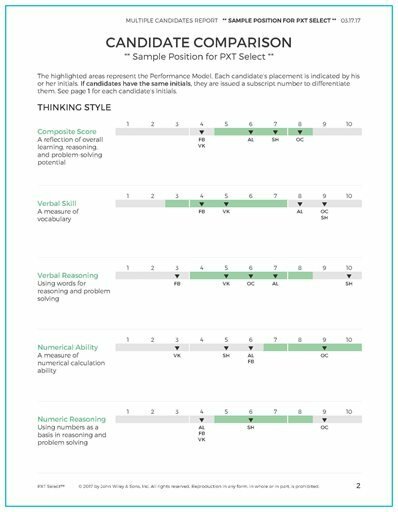 An explanation of what the PXT Select assessment measures. Help managers discover how they can work more effectively with their employees. A strong relationship between a manager and employee can make a big difference in the workplace. Attend a PXT Select™ Showcase to see firsthand how PXT Select™ makes the very human decisions about hiring simpler and smarter.